Metal Clay, the Clay that turns into pure silver or gold. 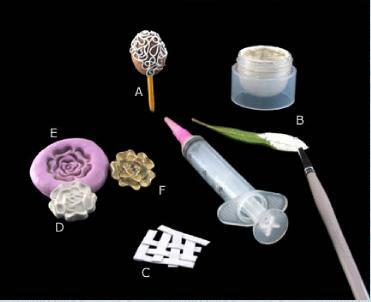 Metal Clay is a revolutionary material that requires no jewelry or metal working experience. The Clay consists of molecular sized particles of pure gold or silver in an organic, non-toxic binder and water. The result is a soft, workable material that can be shaped like ceramic clay using simple, inexpensive tools. The clay can be formed in many ways such as sculpting, molding, carving, and stamping. It's available in lump form, sheet, as slip or loaded in a syringe. Fire it in a kiln or on a gas stove. The binder burns out leaving a one-of-a-kind pure silver or gold masterpiece. Two brands of clay are currently available - - Precious Metal Clay (PMC) and Art Clay. Covering a burnable core with extruded clay from a syringe to form a hollow bead. Painting paste/slip onto organic material, eg. a leaf. Pressing clay into a silicon mold (E) formed from a solid object (F).